So yah, I love it. We recently attended a Glambassador Event at the Vaughan location to test out their new winter services and of course, Isabelle was in her element. This kid rarely sits still for any extended period of time, but let me tell you, she didn't move a muscle when her nails were getting painted! And she loves talking to all the Glama Gal aestheticians on site, and they truly make her feel special. She even went home to tell her baby sister that when she's bigger, she can come to Glama Gals too! Honestly. Glama Gals has great holiday programs and events coming up over the next few weeks, including their Holiday Camp ($60 per tween). All camps are 10-4 p.m. and include crafts and spa services. The services range from Snowman Nail Designs (think: Olaf on your pinky! ), Arctic Facial Mists, Candy Cane Manis and Pedis, making Gingerbread Lip Gloss, Holiday Pearl Bracelets and more. For a full list of services and to register, visit their website. If that wasn't enough, they've also organized a Funky Sweater Holiday Party on December 23 AND a Noon New Year's Eve Bash! Each event will give the tweens an opportunity to play, create and make magical memories. These events are happening at EVERY Glama Gal location, so you'll want to register online for the location nearest you. 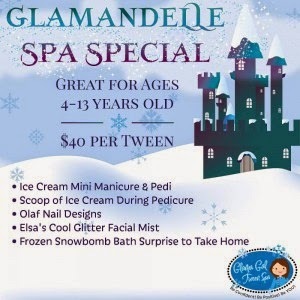 And in the spirit of all things magical and FROZEN, the newest special to Glama Gals is the GLAMANDELLE SPA SPECIAL! The Glamandelle Special can be booked through any location. It doesn't take place on a particular day, like the events do. Laura and Josie at Glama Gals are SO generous, they've given me a Glamandelle Spa Special to give away! All you have to do is enter the Rafflecopter below. This would be a great pre-holiday gift to the Glama Gal on your list! Disclaimer: I'm a Glambassador and receive special perks because of my affiliation. All opinions expressed on the blog remain my own.